I travel quite a bit for both business and pleasure. I enjoy driving, cycling and walking while I am traveling. 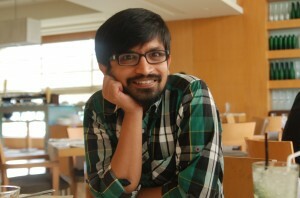 I am also a data geek and blogger so its important for me to record things. 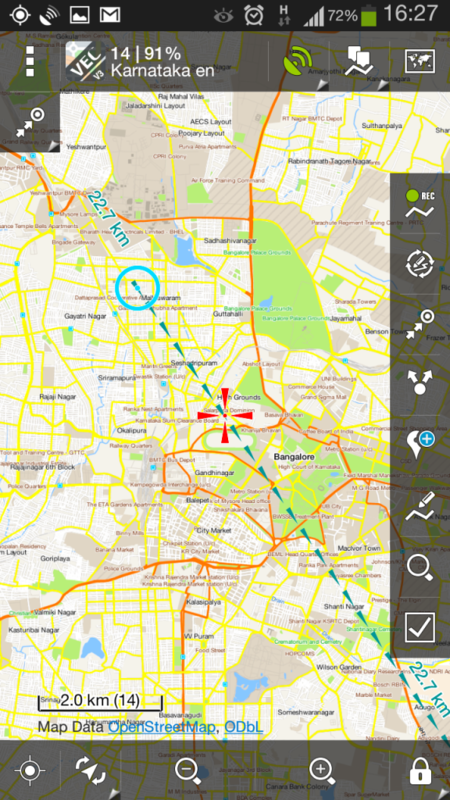 In last few years I have tried multiple map applications while traveling both in cities where I had great connection and in remote areas with no network. The only map that has consistently worked for me in all locations and in most situations is Locus. This blog post is long and detailed. 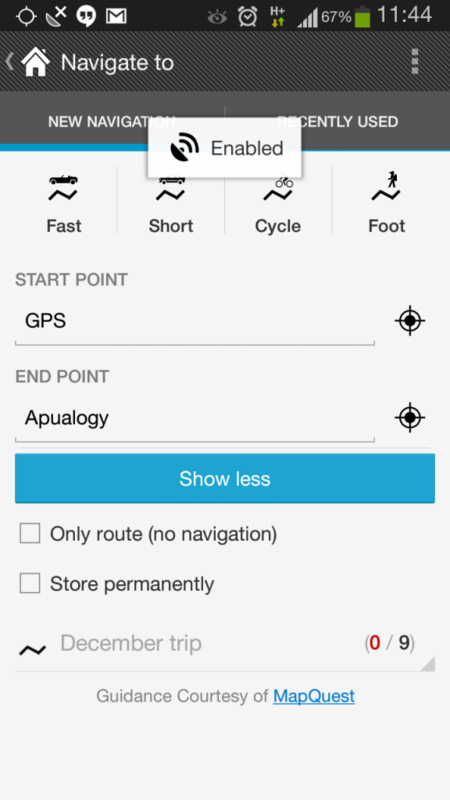 It lists the essentials features that I expect from a map app and explains how Locus satisfies them. It also has several links to How-tos, explanations etc if you like to try them. So get a hot cup of . 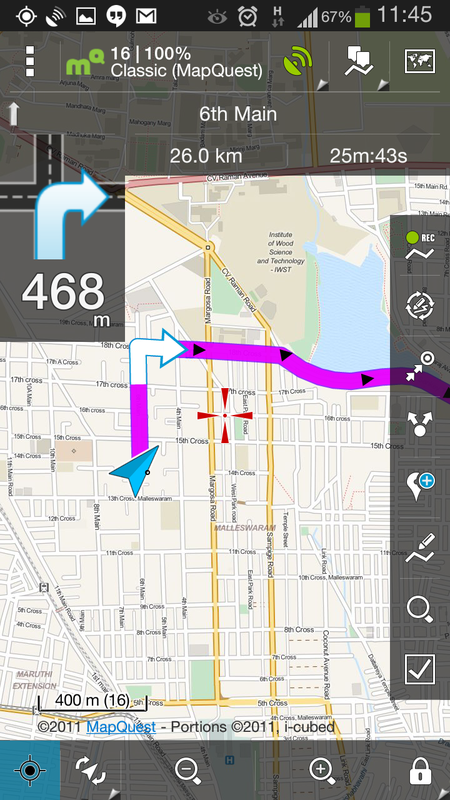 Locus is an android map application available in Google play market in Free and Pro versions. You can see the difference between them on their website. I use pro-version. Locus supports all almost all Open Licensed map services. 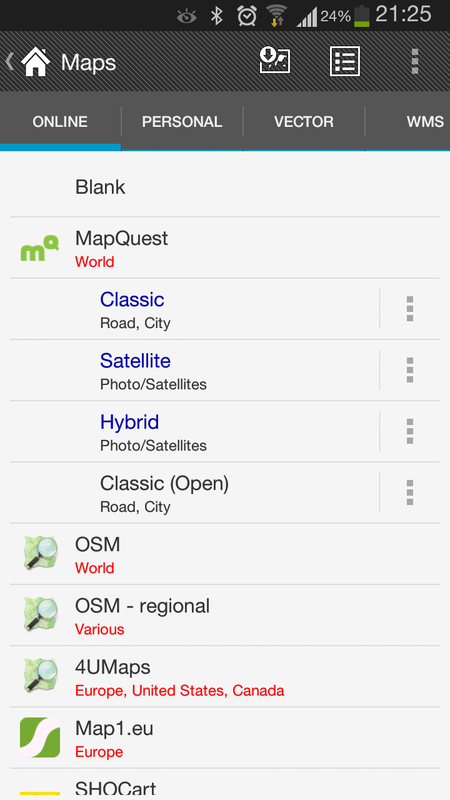 The most useful ones are OSM, OSM offshoots (like cycle map or hike map). I mostly use MapQuest classic maps based on OSM data. Its cleaner and faster. There are at the least a dozen online maps pre-configured. Locus also supports WMS layered services. They can be layered over any other basemaps. For example you can overlay OpenWeatherMaps WMS layer to display weather on map. 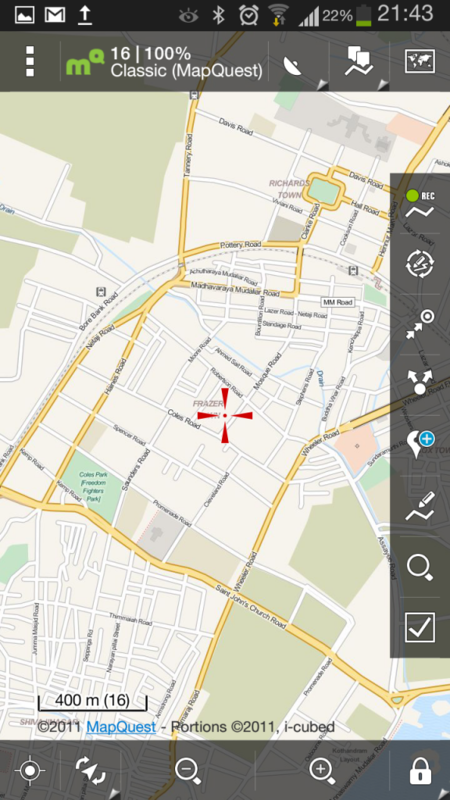 Make your own offline maps using Mobile Atlas Creator. For locus you should use “MBTiles SQLite” as output format. Then copy the file to android. Import using Maps Personal settings add. You could use RM Maps type too. But I prefer MBTiles format, I have written a whole blog post about it. Try not to download the whole country or state, it puts a lot of pressure on OpenStreetMap servers. A city level map download should be okay. Also keeps the file size small and helps locus to load the maps faster. Try and share the map files with friends. Upload it to torrents or file servers. OpenStreetMap license is very liberal and allows sharing according Creative Commons BY-SA. 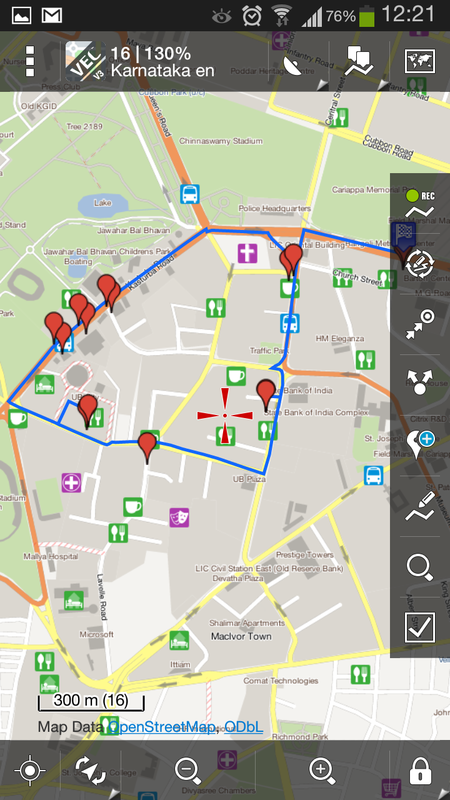 Download the MB Tiles map format using Mobac. 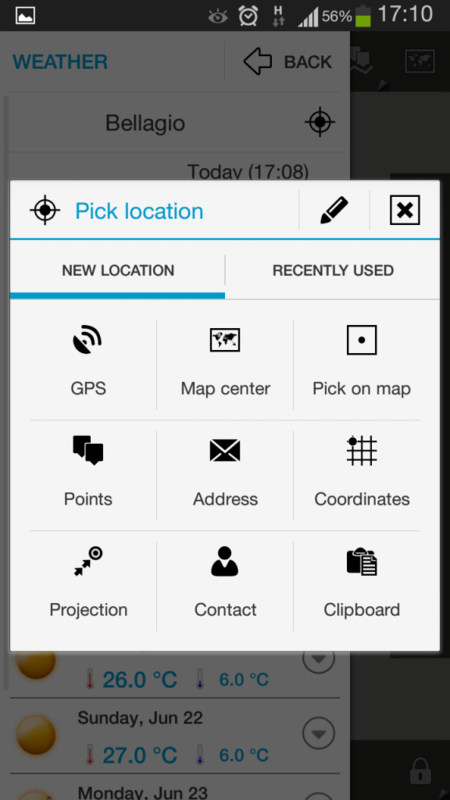 Locus also allows you to download the maps from within the app. 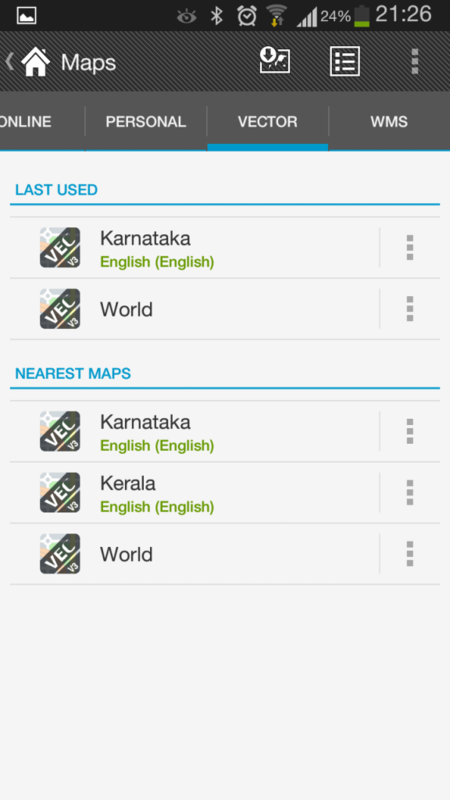 I use it only when I am on the go and need an urgent need to go offline and want maps. It stores the map in the RMSqlite format. Locus also sells vector maps. They are very optimized and are quite affordable. You can buy them inside the Locus. These vector maps are created using tiles from OSM using mapforge. You can try it too. I just buy them because its easy. Works both online and offline. Its easy when online. Search for an address or go to a POI and click on the Navigate to link. 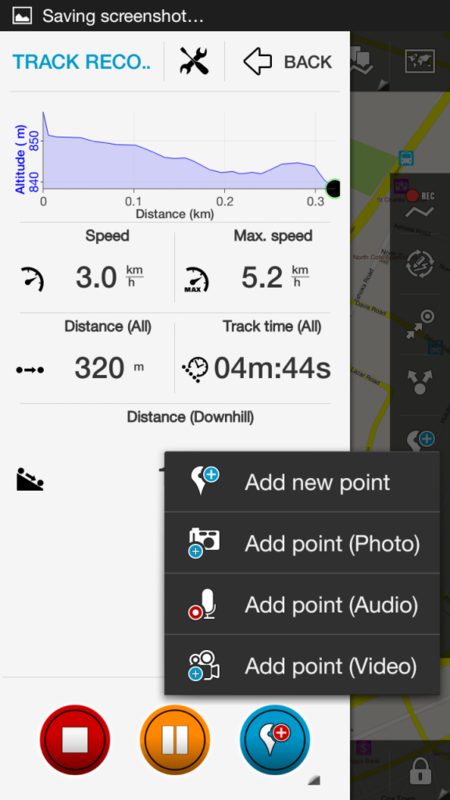 You can also store the navigation info for offline usage. But if there is chance that you would want to find routes when offline then its possible only with an extra UI-less app BRouter. You can do routing/rerouting while being offline. You can create various profiles to adapt the routing. It also comes with predefined profiles like walking, trekking, cycling etc Learn more about brouter from developers website. But lets say you are in an area where you do have connection nor do you have maps. If you want to navigate to a POI. The you could use Guide On which will show you a straight line which you roughly follow or compass which will have a pointer towards the POI. They will also show you the distance. This is useful only if you are lost in a jungle or if you have only limited feature set maps. Even though I change plans very often, I do plan a lot. The fact that I keep changing plans means that I need something that can cope with me on the go. Just before the travel I make a list of POIs on the map. Making it on the map helps me to gauge how far and near the places are visually and helps me decide mode of transport. I usually like to walk, ride a bicycle or take public transport. So its important for me to mark bus-stops, parking-places etc next to the POIs. The I search for eating places or bars or cafes. I choose them and them to the map. Now we kind have the things I want to do on the map. Now I will make a route to cover them. This is exactly the process I followed at Milan while cycling around. Locus helps a great deal with this. You can add POIs by searching. 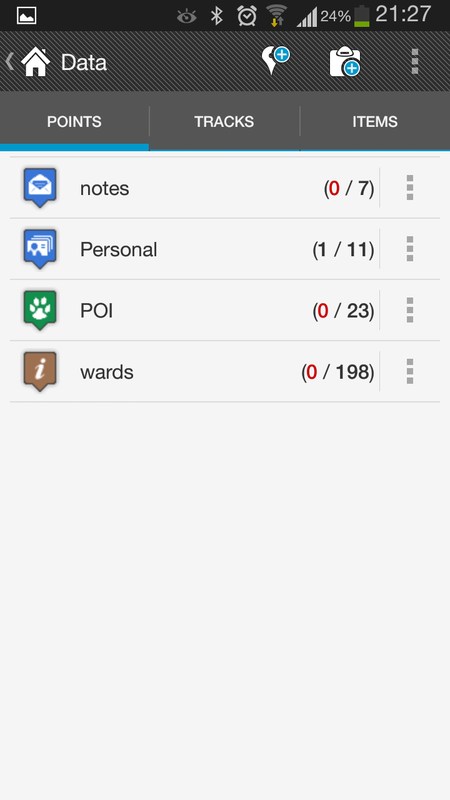 You can add all kinds (text, voice, video) notes to POIs. You can also add routes from POI to POI (“Add new routes & measure”). But here comes the best part, you can export the whole thing as a single KMZ file (POIs, routes and other notes) and send it to friends for their reference. 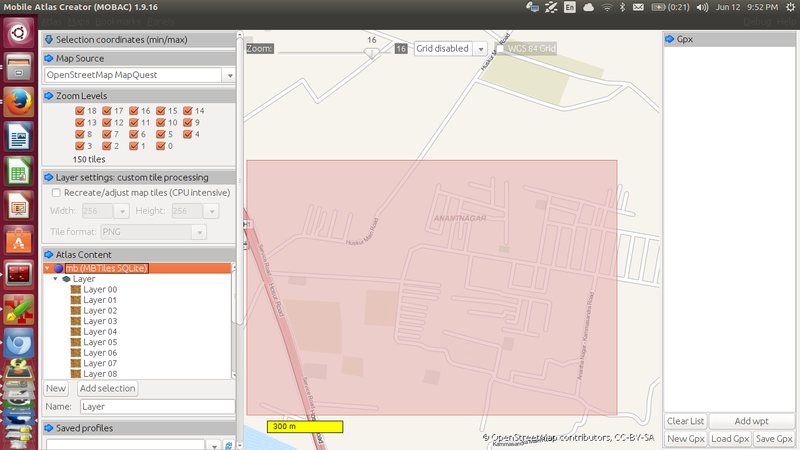 Locus can also import KML (No media files, just POIs n Routes), KMZ (With media like pics) and GPX. So you can also plan on your computer and import into locus. 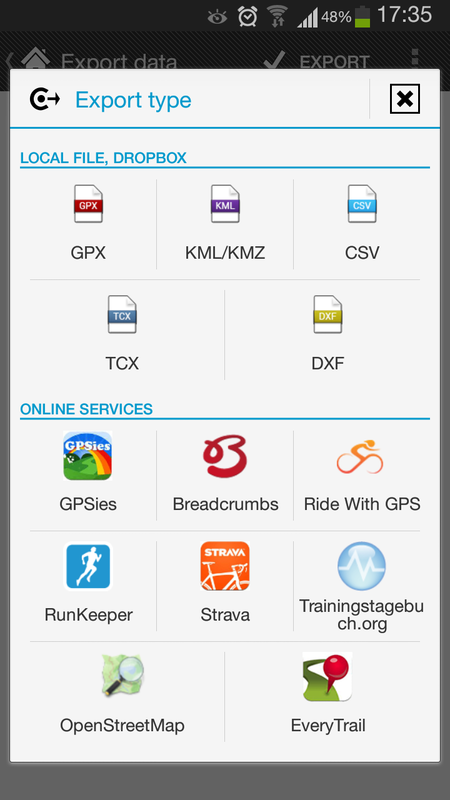 There websites like google mapengine can export KML, routeplanner can give GPX files. Or you can download the plans planned and uploaded by someone else at WanderMap, WikiLoc, EveryTrail, AllTrails by NGC etc. These community websites have plans not just for cities but hiking and trekking too. In locus you can set notifications to alert when a POI is nearby, specially useful when you are cycling and not looking at the map. You can also set notification to alert you when you are off the path. Locus also has a feature of Live tracking. Where the locus can post the location and other details to a webserver. Ofcourse this means you need to be connected, but this is really useful if you want to let the world know where you are automatically. Lets say if you are running a marathon or doing a long cycle trip, wouldn’t it be awesome to show your location to your supporters. Locus doesn’t have any server, its your server and hence you are in control. I have a written a web app for my use. I will probably make it open source soon. Weather is one of the most important factor when you are traveling. 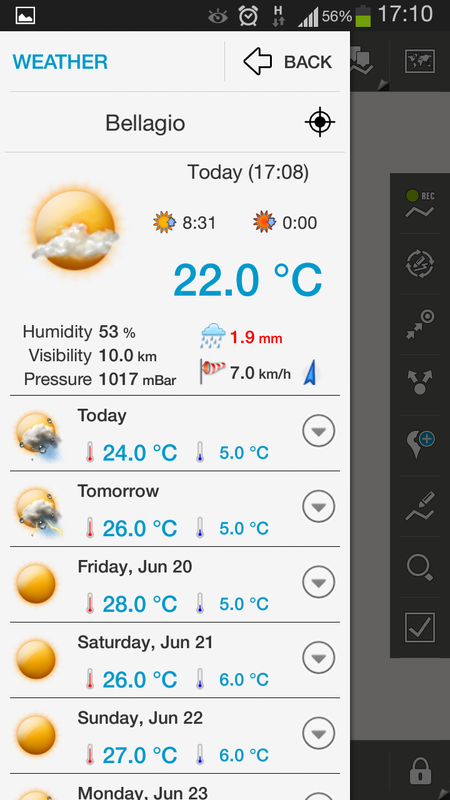 Locus has built-in weather report which includes speed of wind, how much it’s going to rain, air pressure, humidity, and time of sunrise and sunset an. Sunrise and sunset is specially important if you are hiking. It also includes forecast for next 7 days. 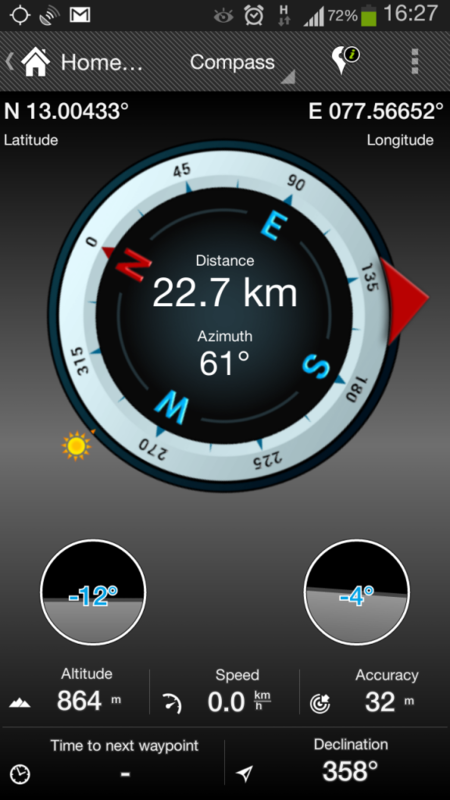 You can find the weather of current location or any location on the map. Just go to that (crosshair) location on the map, and click on Main Menu More Weather. If you are experimental then there are WMS weather services provided by different provides (OpenWeatherMap, ISRO, NASA etc) that you can import and explore.